Are any of you familiar with diy pom-poms? Fun fact: they've been one of my favorite crafts to make ever since I was a kid! I used to find any reason to cut out scrap pieces of cardboard lying around the house and hit up the yarn aisle of the craft store to make them for room decorations! But whoever thought to put pom-poms on clothes is a genius. Pom-poms are just so fun, don't you think? 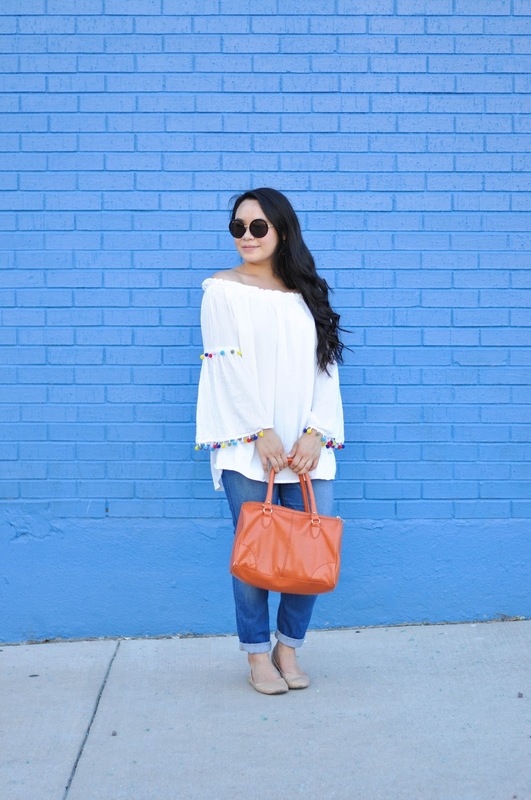 This white off-the-shoulder pom-pom top is so affordable and totally worth spending on for a fun summer night or even a beach cover-up! 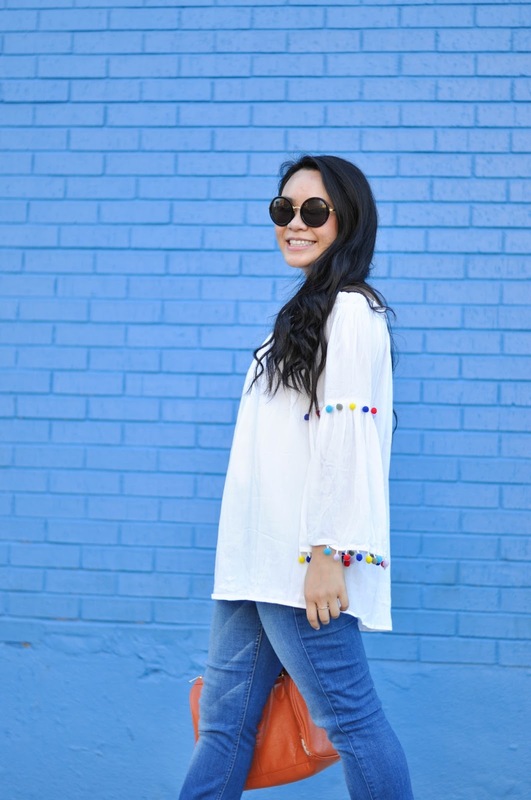 I love me some white tops, because they're so summery and pair with almost any bottoms in your closet. 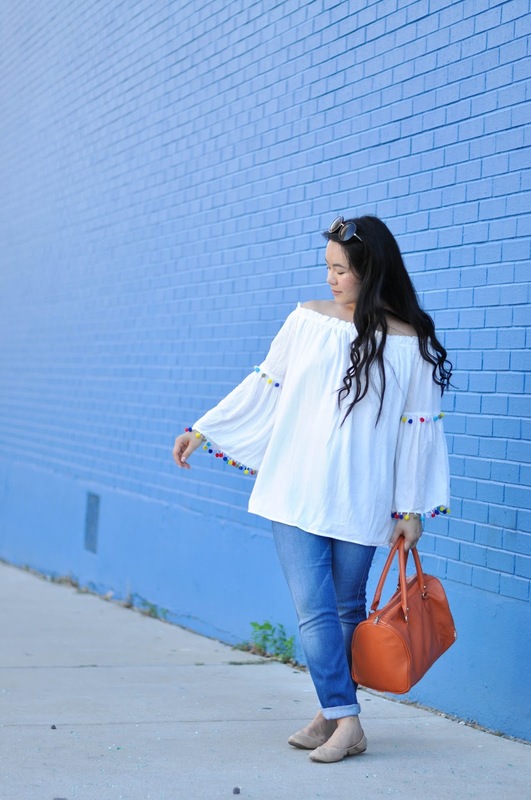 This pom-pom top is especially fun with its bell sleeves and cute + colorful mini pom-poms! 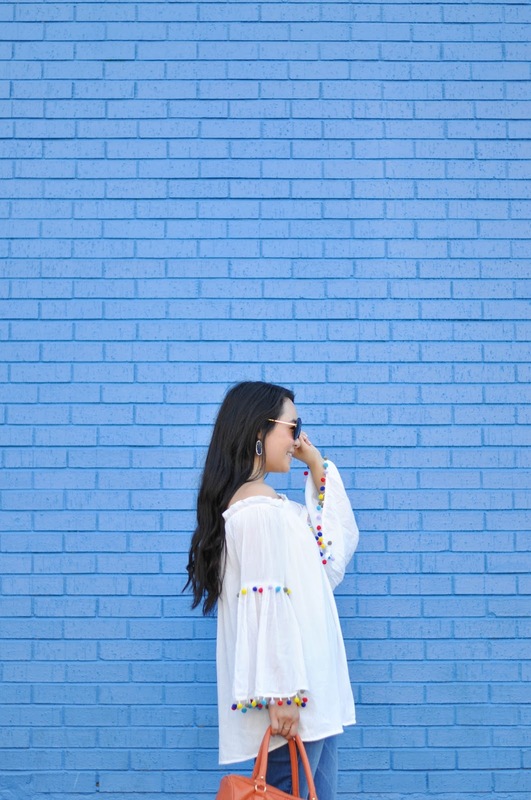 The flowy cut is seriously so airy and comfortable to wear. 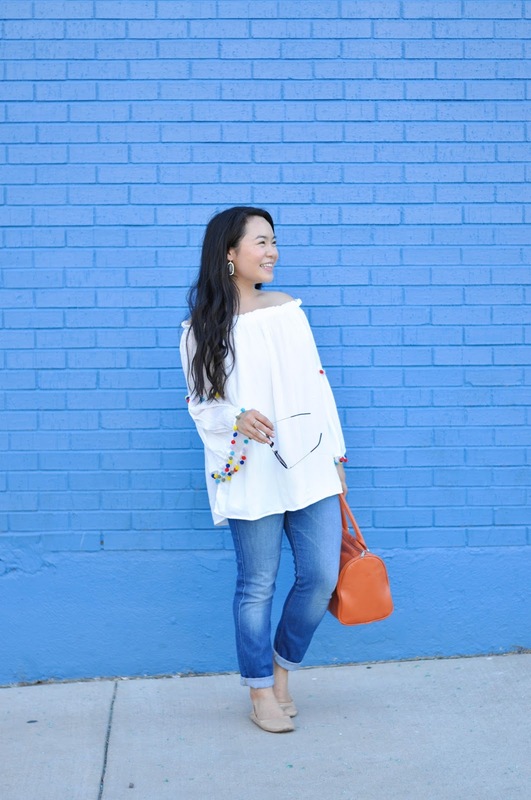 I paired it with my favorite pair of jeans and navy earrings for a sushi dinner at Maiko in Austin, but it would look just as cute with white capris, tucked into some jeans shorts, or even over a swimsuit for a fun little cover-up that can transition perfectly for dinner afterwards! Talk about versatility! 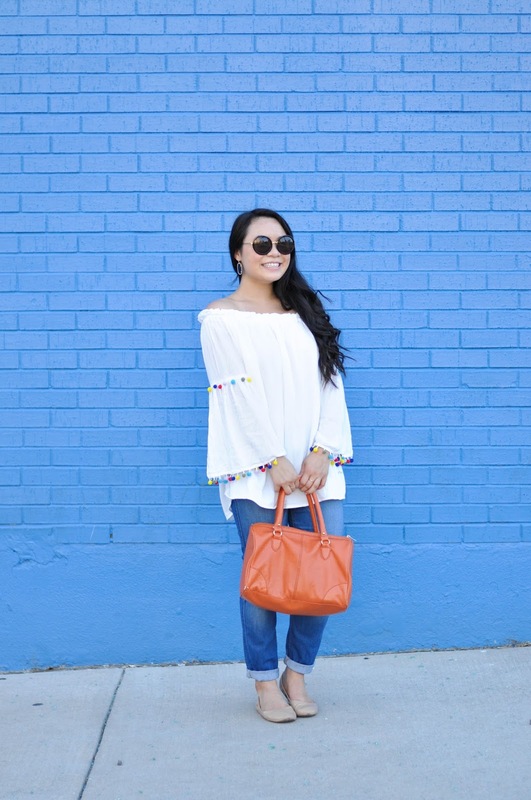 Whether it's a festive summer night, a tropical destination, or lazy day at the pool or beach, this pretty top is perfect for a just little more summer fun! 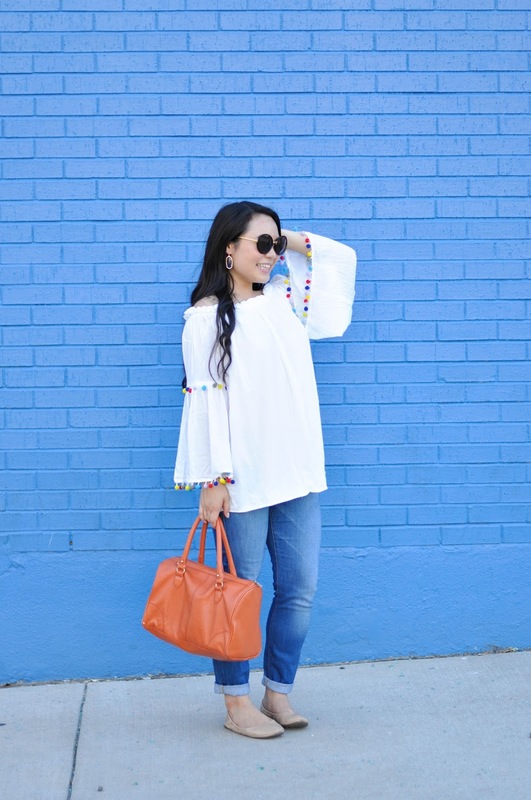 Have you tried the pom-pom trend? If you have, let me know down below! I'd love to know your favorite way to wear them! I'm half way through my California vacation, so be sure to check back very soon for my regular postings on Tuesday and Thursday! Until then, follow along with #SawahInCali if you're interested in some travel inspiration of sunny skies and blue seas. Have a great week, y'all! This is so very cute, Sarah!